Brexit, The EU and GDPR. Is this the worst sandwich filling ever? Is it time to embrace opportunity and change or just moan about ongoing GDPR compliance? The EU brought us GDPR. Love it or loathe it, it’s here to stay. So how do we tackle changes to working practices and transform them into tangible positives? How can business use GDPR, and even Brexit, as catalysts for change and innovation? Brexit and innovation might appear strange bedfellows. Yet we have to do something to shake up this process. Recent uncertainties and changes have proved that always being reactive profoundly affects how we profit in business. What do I mean? Anyone who says ‘That’s how it’s always been’ or ‘we’ve always done things like this.’ are not really exhibiting the qualities necessary for staying ahead of the competition or in fact, leading the marketplace. 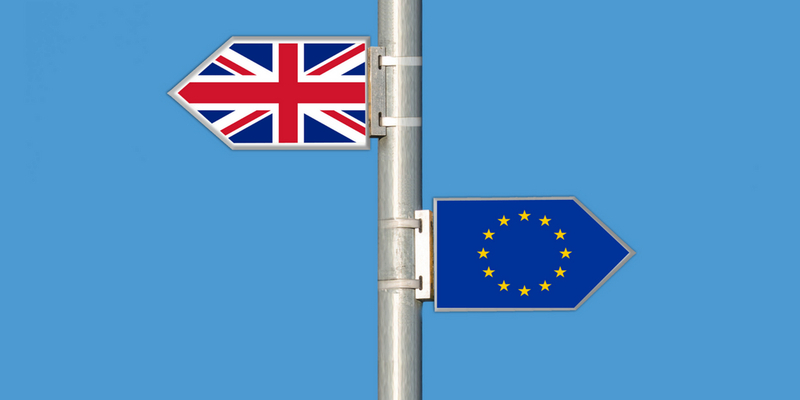 The EEF (The Manufacturers’ Association) is concerned about business uncertainty and are offering Brexit support and an online Brexit Trade toolkit. How can we start to love uncertainty and stop hiding under the table? British politicians have so far not demonstrated much creativity or innovation when it comes to Brexit. British industry is becoming frustrated and business in general is beginning to feel uncertainty. What the economy almost never reacts well to is uncertainty. So, what’s the point here? Uncertainty has almost become the normal modus operandi. Those who tend to succeed generally predict and react to change positively. Being flexible enough to embrace difference, to see change as an opportunity, will surely thrive. It makes sense doesn’t it? It’s like looking at an automatic washing machine and saying, ‘ I don’t need such a thing, it’s fine I always wash my clothes in the river, thanks.’ Why would you? We saw a lot of that kind of response when GDPR was first mooted as a future piece of legislation. It was considered something that was going to cause a lot of additional work and ‘a hammer to crack a nut.’ We don’t want to debate those reactions here. However, it is time to consider how GDPR can actually represent a watershed moment. This is the start of a different way of doing things. Align that philosophy to Brexit negotiations. Perhaps business should not wait for the government to hatch an acceptable plan but simply prepare for the very worst outcome and get on with it. Anything better than awful will be a bonus! If we believe it’s possible to make changes, embrace innovation and aim to be as creative in our delivery as possible then people will do business with us. If we are the best, if we represent innovative practice everyone will want what we have. Look at Dyson or Apple as two examples. Dyson are not “cheap” products. If you are looking for a product that revolutionises the everyday and looks stylish then buy a Dyson. Yes, others have copied but Dyson initially “hoovered up” (haha) In fact we all know James Dyson originally offered his design to Hoover. They turned it down not seeing the need for this revolutionary approach to a business that had been doing well since the beginning of time. Dyson would say frustration and failure fuel innovation. GDPR is the point at which we start looking at data as human in origin. Every name, address and age tells an individual story. Quite often it’s the messages that drop between the gaps that prove most interesting. The data that doesn’t “fit” is worth interrogating. GDPR compliance means will have already cleaned up your data sets. Some of you will be bemoaning the loss of email addresses. But, wait up, those people who have not opted in were of no use to your company. They have voted with their fingers. Those people who did stay with you recognise your worth, know you have something they want. So, how do you nurture those extremely valuable people? Tsk, this is the 3rd email we’ve sent you! This is the 3rd email we’ve sent without a response. We just cannot rely on what has gone before. Nothing remains the same. Therefore it’s time to get out there and get ahead. We want to develop businesses that people want to buy from regardless of additional duties, trade barriers, difficulties or taxes. People will build all that into their decision about whether they want to pay for what you are selling. They’ll do that when they see the worth and feel the impact your company will make to their lives. Doing more than just paying lip service to GDPR shows you care about your clients. It demonstrates that you value their data, that you treat people as individuals and that each one matters. By contacting people on your list once in a while to tell them how you have protected their data and what other news you have is not a bad approach. The GDPR Tracker can help you start to manage or revolutionise the management of ongoing compliance. Click here to find out how your business can take advantage of this opportunity to thrive. Being the very best at what you do, taking the approach that nothing is too much trouble and putting the customer right, left and centre of what you do are three aspects of great business practice. Imagine if someone asked you to demonstrate your GDPR compliance and you could send a report within the hour with a reassuring message. Wouldn’t people be impressed? If you had a GDPR Tracker capability within your business wouldn’t it take the headache away but also add an element of trust to your business? From every disaster comes an opportunity. “The introduction of intelligently integrated systems for location-based DOM (Disaster Operations Management) would provide the assessment and management that utilities require to improve responsiveness. It would enable them to move away from being reactive, towards a process that helps them anticipate, plan and execute methods to reduce the impact of disasters. This was necessary after the imposition of heavy fines should utility companies fail to reconnect quickly after a natural disaster. What this does is focus the mind. We no longer consider the disaster per se, but how we plan for and also respond to such a challenge. When architects and engineers started designing earthquake resistant buildings we begin to manage a situation and prevent destruction rather than seeing how quickly we could put the pieces back together again. By using data effectively we can predict, plan and power through problems. That’s what we mean by GDPR and Brexit representing business opportunities. By focusing on the bigger picture and finding ways to create new opportunities we can strengthen business, protect and utilise data more efficiently and operate effectively in the new business landscape. Now, isn’t that a better way to do business? If you would like to know more about how the GDPR Tracker can impact on your business then email us and we’ll help you start to leverage the fantastic opportunities that GDPR can bring. Could your business demonstrate GDPR compliance if someone asked you today? – You had a complaint? – You had a request from a Data Subject to hand over their Personal Data? – Or the ICO (Or your local Data Protection Authority) came knocking? How quickly could you show someone everything you’ve put in place? Fill out the form belowa to get your Free GDPR assessment – It could be the best 30 minutes you spend today. GDPR – will it be fur coat and no knickers?